Royalty Tours USA: Royalty meets up with Jacob Landis who's going to all 30 MLB ballparks this year for a special cause by riding a bike! Royalty meets up with Jacob Landis who's going to all 30 MLB ballparks this year for a special cause by riding a bike! On Friday, April 12th, when I was on my lunch break I saw a tweet on Twitter that a group called Ballpark Chasers that I belong to had retweeted. They were mentioned in a blog post about going to see live baseball games all around the country. I glanced over the story titled Inside the Great American Road Trip. In the article, they mentioned some other roadtrippers that I've met in my travels over the past few years. In addition, they mentioned a young man named Jacob Landis who I never heard of until I clicked on his name which linked me to his website, Jacob's Ride. You can also follow him on Twitter. His handle is @JacobsRide2013. By doing so, I found out that Jacob who resides in Annapolis, Maryland was deaf at age 10 received a cochlear implant which has allowed him to be fully functional in the hearing world. 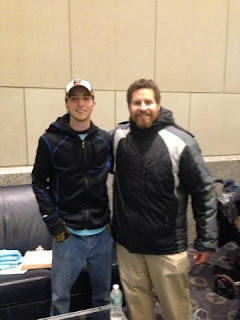 Jacob decided to do something special in order to give back to others like him who have a similar disability in life. He hopes to raise $1Million dollars for others who could benefit from a cochlear implant but can't afford to get one. In order to attempt to accomplish this feat, he's in the midst of riding a bike all over North America to see all 30 Major League Baseball ballparks this season. He's riding around with his cousin Jack Riddle. They plan to do this if all goes according to their schedule that's posted on his website on September 24th in Miami at Marlins Park. I realize it's a rigorous ride that they're taking on. I want to wish them all the best in trying to do this. Ironically when I noticed their schedule I saw they were going to be at Yankee Stadium that night. I immediately contacted them so I could see if I could arrange to meet them before the game since I was going there too that night. Thankfully they responded quickly to my e-mail and tweets on Twitter. By doing so, I had the privilege & honor of meeting and greeting them near the left field gate inside the ballpark where they were conducting a pre game get together for the special group of people who were partaking in their special visit with Dana Constantino who was there supporting them from an organization called Hearing Loss Association of America. It was a thrill for me to meet Jacob who has a disability but he's been fortunate to overcome it and he's now trying to give back to others who are in a similar situation. I hope that he does indeed find a way to make this happen. I told him that a few years ago I met up with a young man named Darren O'Donnell who did a similar type trip of biking to all the ballparks. The difference was that Darren did it for his own personal benefit. He didn't even try to publicize it until a website in Tampa, Florida got wind of him in June 2011. As a result, I found out about him. I wound up meeting him at Citi Field in August when he rode through NYC. I thought what he was doing was beyond belief to be perfectly honest. Quite amazingly he did see all the ballparks as he planned to. He allowed margin for error so he could get from one place to another. It worked out for him and he has lived to tell the tale. I hope Jacob can do the same later this year. In the meantime, I plan to follow his whereabouts as he tries to do it. I hope that people I know around the country can meet him at a game as well. If you can't, that's fine. It's not easy for everybody to meet others on the spur of the moment and/or with plenty of advance notice. Every day we live is an adventure. These days you never know what can happen next. If that's the case, I recommend that for as little as $10 you can donate to a very special cause by helping Jacob as he attempts to hit a home run for hearing. If you can't afford to contribute I don't want anybody to feel obligated to do so. It would be a nice gesture but I don't want anybody I know to feel bad. That decision is totally up to you. I want to reach to my loyal readers and followers because you're special people in my life. I greatly appreciate anybody who devoted any of their precious time to reading my blog. I'm a kind hearted human being first and foremost. I personally feel for Jacob. If I was in his shoes I certainly hope there are good people out in the world that can help his cause. Always remember life is too short, we all have to help each other make it better while we're here regardless of the cards we're dealt. 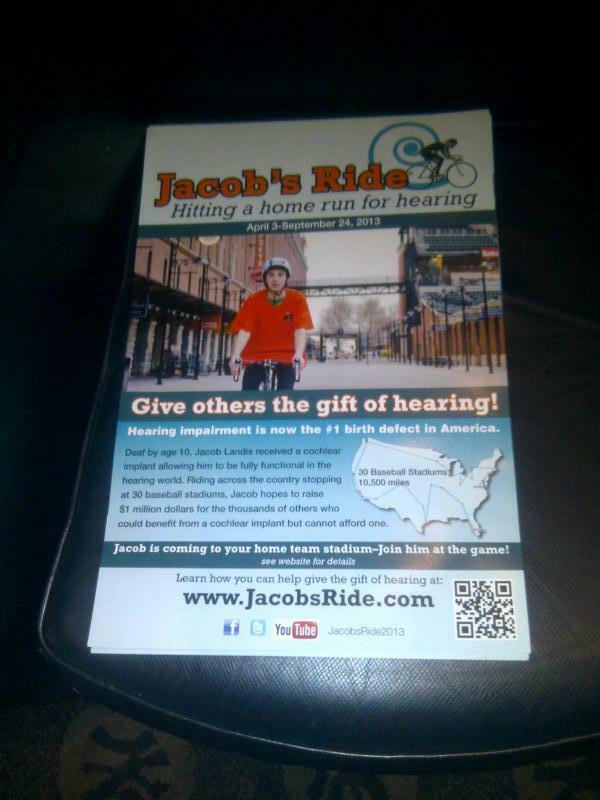 If you want to donate, please text JACOB to 50555 to give $10 to the Hearing Loss Association of America which benefits Jacob's Ride.